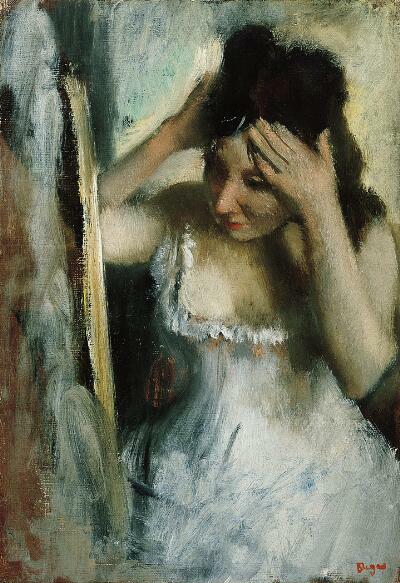 More swiftly and richly painted than most Degas works of the 1870s, this scene of a woman combing her hair offers few clues to its subject’s identity. The artist returned again and again to the theme of women combing their hair—from backstage to brothel to bourgeois interior—capitalizing on the chance it provided to portray a figure absorbed in her task, seemingly unaware she is being observed. Degas painted this particular composition on top of an earlier picture, probably a portrait, which he turned upside down before beginning anew. The left ear of the hidden sitter remains visible in the curve of the figure’s waist. Edgar Degas frequently depicted women grooming themselves. Here, he offers us an intimate look at a woman arranging her hair before a mirror, absorbed in her own reflection. She is completely oblivious to our presence. Her dark hair and white bodice set off the creamy tones of her face, her red lips adding a spark of color. Degas compared scenes like this to looking through a keyhole, making us feel like voyeurs peering without knowledge or permission. Degas's attitude toward women has often been described as misogynous. Rarely depicting them as individuals, he portrayed them in unusual and awkward poses, their faces hidden from view. Yet he also brought us closer than any artist before him to the everyday lives of these women—bathing, dressing, ironing. He lets us in on their most private activities, yet made them seem distant and mysterious.